This entry was posted on May 10, 2013 by admin. 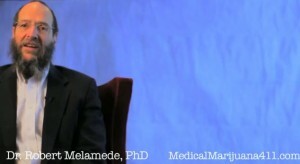 Hi, I'm Dr Robert Melamede PhD. I'm a professor at the University of Colorado at Colorado Springs. I was the former chairman of the biology department there. And currently in addition to my role as professor I am also the CEO and president of Cannabis Science a publicly traded company on the NASDEC bulletin board (CBIS). I was studying free radicals in that I was studying radiation chemistry and DNA repair. So that gave me a foundation to understand free radicals as very important modulators, essentially of aging and age related illnesses. Which is really what cannabis does. So, by combining my understanding of life from the thermodynamic point of view, pharma-equilibriam thermodynamic point of view in conjunction with my expertise in radiation chemistry and free radicals and being a lifelong cannabis user, I have been in a very unique position to assemble those three entities into a cohesive perspective as to what life is and the fundamental role that the endocannabinoid system plays in life and how it modulates a imbalance we all suffer. People are generally aware that Omega-3's are good for you and they inhibit various cardio vascular problems. What most people are not aware of is that they're participatory directly in the endocannabinoid system, in that they make a variety of our endocannabinoids, and they are part of the bigger picture of lipid metabolism of which the endocannabinoid system is kind of a central focal point. So there is numerous benefits from these essential fatty acids that we can help modulate, we can change our biochemistry, by our nutritional intake. But going beyond that, is only certain limitations to how much you can vary our endocannabinoid activity from that nutritional point of view. So that for many, many, many people with a whole huge spectrum of illnesses, ranging from cardio vascular disease, skeletal disease like osteoporosis, cognitive dysfunction from neurological deterioration associated with aging, and literally all the auto-immune diseases, and many cancers they all have free radicals as part of their ideology. And cannabinoids, be they the ones we make or the ones we take in, benefit those. So it's now my position that in order for us to reset our endocannabinoid activity thermostat, to lower the damage caused by essentially a degree of unnecessary inflammatory responses, we have to essentially consume cannabis, with cannabis being now from my perspective, an essential nutrient by virtue of how it will turn down inflammatory responses and inhibit the aging process and the negative consequences of age related illnesses. No body dies from being old, they die from age related illnesses. Very safe and effective medicine that's able to uniquely tap into our endocannabinoid system, which interestingly and ironically regulates everything our entire body.